Summer has slipped away from us, but there are still a few warm days remaining before you need to pack up the grill for the winter. Tomato patches are waning, basil is going to seed and cucumbers are finally petering out. But all are still here. And as it happens, partridge season has opened along much of the country’s Northern tier right about this time. Hungarian partridges and sharp-tailed grouse have been in season for weeks in places like Montana. Blue grouse are open in Oregon. Quail are not far behind here in California, and chukar season is coming in Nevada. 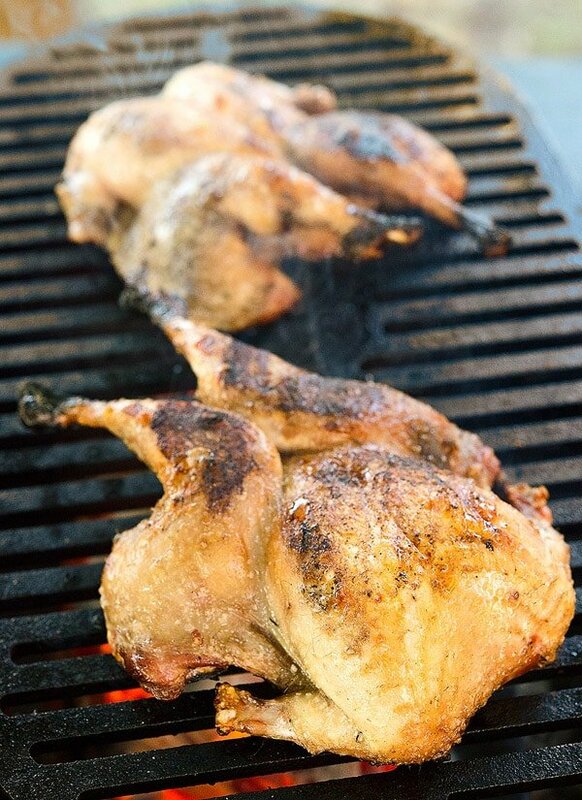 One my all-time favorite ways to cook small birds is on the grill. Doves are great simply plucked and set right on the hot grates. But slightly larger birds cook better when spatchcocked, which is a fancy way to say split down the back. Drop a brick on them to flatten the birds out even more and you can get a perfectly cooked partridge, chukar, grouse, quail — and yes, Cornish game hens for the non-hunters out there — in less than 20 minutes. I do this for all sorts of birds, pigeons, for example. But members of the chicken family lay flatter on the grill than do either ducks or pigeons. Of course, sometimes I will actually cut out the keelbone to have a really flattened bird, but that’s another post. Make sure the birds are at room temperature when you grill them, otherwise there’s a good chance that the center of the breast and the thighs won’t be cooked through before the rest chars. Do most of your cooking on the opened-up side, i.e., breast side up. This prevents the breast from getting too dry. Oh yeah, and you need a hot fire. A screaming hot charcoal or wood fire. Gas will work, but the beauty of this technique is that smoky aroma. 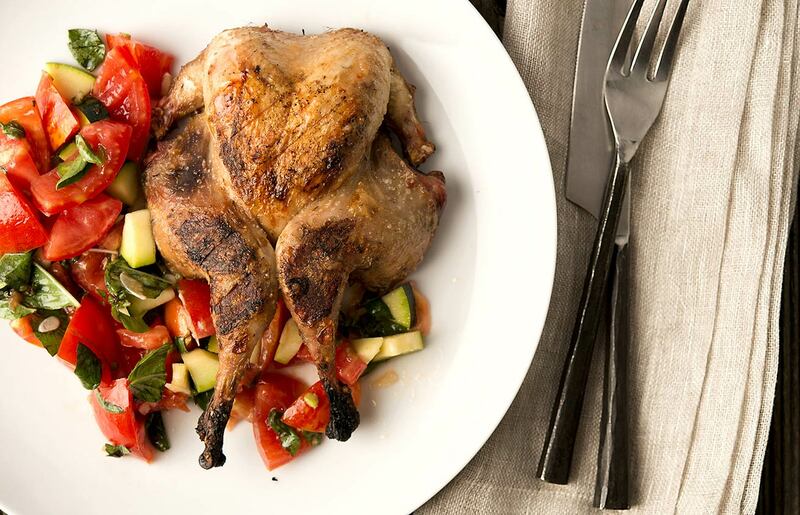 Serve your partridges with the remains of your garden, tossed into a salad. Use my recipe only as a guide. Summer’s over people, almost time for frost and the real hunting season. Enjoy your last warm days in style! 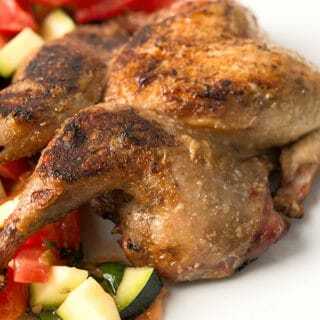 Chukar or Hungarian partridges - or hell, Cornish game hens - split and grilled with a fresh tomato salad. Super easy to make. Start by taking the partridges out of the fridge: Set them on a cutting board to come to room temperature while you make the tomato salad. Make the salad by adding all the ingredients except for the basil to a large bowl. Toss to combine. You don't add the basil until later because it will discolor if left too long. Add it right before you serve. Spatchcock the birds while the tomato salad marinates. Spatchcocking involves cutting out the backbones of the birds and flattening them so you can grill them faster. 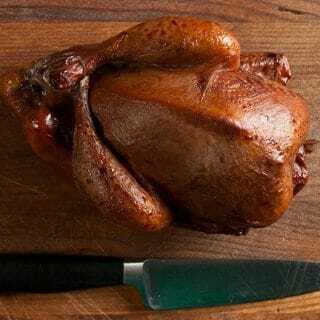 If you've never done this, I have a tutorial I did with Cornish game hens over at Simply Recipes. Once your birds are flattened and partially deboned, coat them with oil and salt them well. Get your grill very hot and make sure the grates are clean. Right before you start cooking the birds, soak a paper towel in some vegetable oil grab it with tongs. Wipe down the grill grates. Lay the partridges down on the grill breast side up. If you have one, grab a brick and weigh down the partridges with it. This gives you better contact with the grill. Let the birds cook for at 8 to 10 minutes. You want to do most of the cooking on this side; it helps keep the breast meat moister. Turn the partridges and grill them breast side down only until they get nice char marks, which typically takes about 2 to 3 minutes. If the birds have not yet cooked through -- some will, most won't -- put the partridges back breast side up for a few more minutes. If they arc upwards, put the brick back on them. When they are done, let the birds rest on a cutting board for 5 minutes before serving them with the tomato salad. You can find all kinds of recipes for partridges, chukars and other upland game birds, right here on Hunter Angler Gardener Cook! We grill on a pellet grill. When you say very hot what temperature is ideal for the grate temp? Jacquelyn: I’d say as hot as you can get it, like 500F or more. But keep in mind I leave the cover off the grill when I do this. With a pellet grill, I would get the grates very hot and sear the breast side for a few minutes to get the skin all crispy, remove the birds, then drop the heat on the grill to very low, like 225F. When it gets there, put the birds back breast side up this time and slow roast until they’re done, about 15-20 minutes more. I agree with Doc Banjo, “Grilling season is never over”! I’ll shovel snow and brave single digit temps if need be. Grill on!